RNA interference (RNAi) is a research tool used to assign function to genes. Sequencing the human genome has provided the capacity to use RNAi to study this across all genes. Gene silencing with small interfering RNA (siRNA) is one of a set of functional genomics technologies that enable researchers to link gene function to disease, which is one of the key steps in identifying therapeutic targets and creating therapeutic treatments with well-understood mechanisms of action. Fluorescence microscopy has undergone a renaissance and is now a powerful tool to measure gene function using tools such as RNAi. Its use has evolved to a multiparametric drug-discovery tool with the advent of automated systems and numerous probes and fluorescent proteins that allow cellular phenotyping via image analysis. One of the most popular uses is to screen for gene function for drug-target identification. Knocking down the expression of a gene product often leads to phenotypic changes in cell-based assays, allowing deconvolution of biomolecular roles in disease. This is achieved by leveraging assays exploiting phenotype, such as receptor translocation, together with functional genomics. Currenly, RNAi methods are enjoying a revival, and TALEN and CRIPSR methods are being embraced. All these technologies are revitalizing functional genomics. Although phenotypic screening has also enjoyed a resurgence, it remains an expensive research strategy, one burdened by costly assay components and infrastructure requirements. These include automated liquid-handling systems and high-content imaging systems typically used to perform screens. Prohibitive infrastructure and reagent costs have made it difficult for most researchers to routinely use RNAi screening with phenotypic readouts. These barriers have now been lowered through the development of affordable, high-quality automated microscope/imaging systems and the invention of miniaturized RNAi screening technologies that eliminate the requirement for automation infrastructure and reduce cost/data points by orders of magnitude. In fact, it is now possible to screen entire RNAi libraries at the bench, eliminating any need for liquid-handling robotics. Here, we show how the workflow of the Persomics miniaturized RNAi screening platform can be processed and imaged using BioTek’s Cytation Cell Imaging Multi-Mode Reader for a cost-effective RNAi screening platform that most academic labs can afford. Persomics technology is fundamentally different from the multiwell microtiter plates that have become the norm in RNAi screening. Persomics plates replace the experiment-per-well setup with a printed array of spots on an optical glass insert embedded in the base of an SBS standard plate format. In essence, a Persomics plate is one well with an SBS footprint, but within that well are up to a few thousand spots containing unique biological content for RNAi screening. Each of these spots has a diameter of about a third of a millimeter and consists of printed, dried siRNA, which is encapsulated with transfection reagent and a marker dye. Any RNAi sublibrary can be printed per plate as an off-the-shelf product. Importantly, these preprinted plates contain all the reagents required to silence genes in cells grown over them. This off-the-shelf library screening solution requires only a few workflow steps to be ready for phenotypic screening using a cellular assay and an automated fluorescence imaging system, such as the Cytation. Unlike microplate wells, there is no physical barrier between the individual RNAi experiments, making workflows highly parallel and technically straightforward. The array’s proprietary encapsulation technology ensures that printed siRNA stays within the defined spot and does not diffuse into neighboring spots; thus, each spot represents a unique siRNA knockdown experiment. The array technology makes it easy to handle multiple screening experiments, since plate additions address the entire plate using a handheld pipettor. 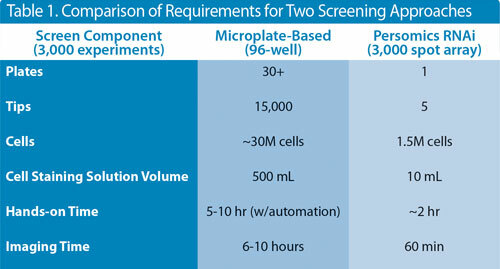 In contrast, performing siRNA experiments in a conventional microplate typically requires up to five addition steps addressing each well individually. Thus, the Persomics technology removes the need for advanced robotics/liquid-handling infrastructure, saves the high cost of consumables tips, and substantially reduces the amount of reagent required per experiment. A comparison of the costs and workflows of conventional methods and Persomics technology is presented in Table 1. The Cytation Cell Imaging Multi-Mode Reader acquires a montage of images to completely image a Persomics array. Individual spots can be analyzed for both intensity-based gene knockdown and for specific phenotypes induced by gene knockdowns. Figure 1 demonstrates both types of readout system. In Figure 1B, an antibody-based readout for RELA knockdown demonstrates a loss of green fluorescence over the array spot. In Figure 1C, a phenotype of multiple nuclei per cell is apparent due to INCENP knockdown, which affects mitosis. The Persomics array-based technology has the potential to revolutionize RNAi screening. The only liquid-handling instrument required is a hand-held pipettor. Each reagent addition addresses all experiments simultaneously. Furthermore, the large reduction in the amount of reagents required, the savings in consumable usage, and the convenience of cost-effective imaging (such as Cytation imaging) make functional genomics screening using phenotypic readouts accessible to a typical lab. Figure 1. Typical phenotypes in HeLa cells on the Persomics RNAi array. (A) Control spot containing nontargeting siRNA. (B) RELA-siRNA-containing spot. (C) INCENP-siRNA-containing spot. Cells were cultivated for 48 hours in culture medium before fixation and staining for RELA expression by indirect immuno-labeling (green) and nuclear staining with Hoechst (blue). Peter R. Banks, Ph.D. (banksp@biotek.com), is scientific director, and Paul Held is Lab Manager at BioTek Instruments. Neil Emans is chief executive officer at Persomics USA.